Tony is originally from Erie, growing up in Harborcreek. 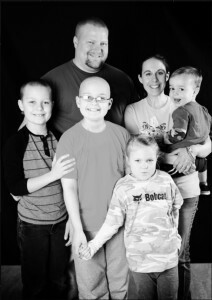 He and his family moved back to Erie in May 2012 to serve at Flagship Church. His wife, Marie, grew up in a rural community just outside of Columbus, Ohio. Tony and Marie married on March 28, 2003, and their family has grown to include four children: Austin, Tyler, Addy and the newest addition, Trenton. Tony answered the call to preach in the beginning of 2011, and he has a passion for sharing the Word both behind the pulpit and in the classroom. He also enjoys working with his hands and using his musical talents in singing for the Lord. Marie graduated from The Ohio State University in December 2010 with a BA in English. She is using her talents to homeschool their children and teach in the church. She has a special heart and a growing passion for the ladies’ ministry here at Flagship. Austin and Tyler serve as our church ushers. Tony and Marie have a love for Erie, a desire to influence others for Christ, and are privileged to serve the Lord as a family!